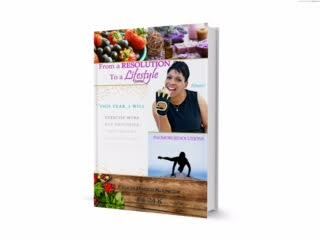 Felicia Kornegay is a personal trainer, wellness coach, and author of the new book From a Resolution to a Lifestyle. She'll be signing copies of her book on Saturday, February 20th, from 3-4 p.m. at our Morrisville store. One month into the new year, when many New Year's Resolutions have fallen by the wayside, she gave us some tips on getting motivated, getting back on track, and thinking about fitness as a lifestyle, rather than just a quick fix. "Maybe it’s just ten or twenty minutes. But you can do a lot in ten minutes. You can do stretches, go for a walk, do specific core exercises. The key is getting them to think, 'I only have 20 minutes. What can I do with that?' Rather than 'I only have 20 minutes. I’m not going to do anything.'" Stick with it, and it will stick! “I tell clients that it takes 21 days to create a habit, whether it’s a good habit or a bad habit. I work with them to incorporate fitness into their lives, so it's not just a fad or a quick fix." "One of the most important things is finding what we call an accountability partner. This may not be someone in your home or a close friend. It may be someone you see at the gym. It’s important that this person is just as motivated as you, if not more motivated than you. You don’t want a person who is going to quit. They will be your cheerleader. They will be there to encourage you on days when you don’t feel like working out: 'Let’s go ahead and get this walk in.'" Sometimes life happens. Some of my clients are new moms. Others have crazy work schedules. Even after you’ve built good habits, life can get in the way. You feel like 'Oh my gosh, everything I’ve worked so hard for has gone out of place.' You need to be able to hit the reset button. Maybe you need to go from three days to two days. You can’t beat yourself up."